My forty-ninth stadium of 2011 was on Friday 19th August 2011 at Ascot Racecourse Ground in Ascot, Berkshire. 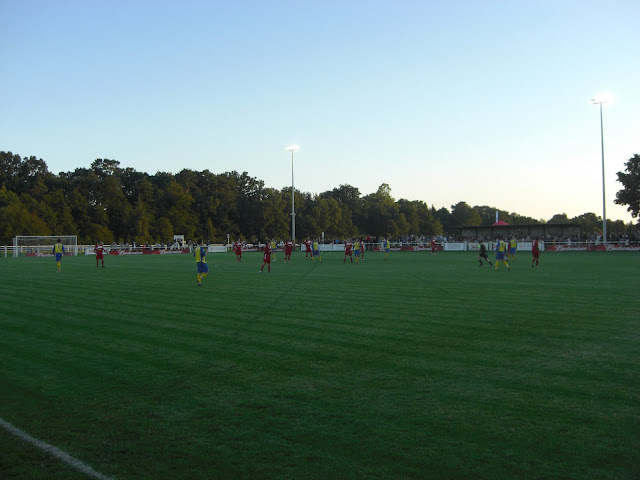 The match was Ascot United vs. Wembley in the F.A. Cup Extra Preliminary Round. Ascot Racecourse Ground is just over a mile from Ascot railway station and sits directly next to part of the horse racing track. It has been home to the club since the late 1960s and has had a series of recent upgrades. Three sides of the ground are general standing areas with just a metal barrier all the way round separating fans from the pitch. As the ground sits within the confines of the horse racing venue, space is at a premium with these spectating areas being fairly narrow, keeping the venue capacity down. All the ground's facilities are located on the west side of the pitch. 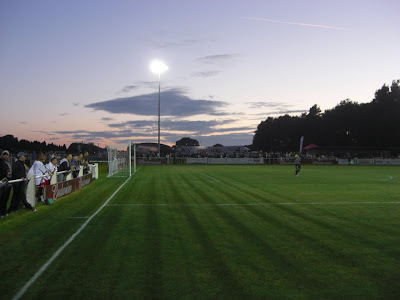 On this side is the one all-seater stand which capable of holding around 115 fans and also an excellent new clubhouse which was finished in 2010. This was one of the smartest looking clubhouses I've seen at non-league level and I imagine the club will be the envy of many in their league. The tie received great publicity in the media for the fact it was the first football match to be shown exclusively live on Facebook, and this combined with the fact Ascot United were making their debut in the F.A. Cup meant the attendance was more than 10 times the usual attendance for the club. A lot of credit must go to Ascot United, the F.A. and Budweiser for putting in place everything required to cope with the greatly increased demand and the evening was a great advert for lower league football. The game was between Hellenic League Premier Division side Ascot United and Combined Counties League Premier Division side Wembley. The visitors had the better opportunities in the first half, hitting the woodwork on two occasions. Ascot United though also had their chances, the closest they came was when a shot was blazed over the bar from close range. The second half started goalless and it wasn't until the 70th minute when Wembley made the break-through, poking home a corner. Ascot then went on the attack and equalised from the penalty spot 10 minutes later. The home side looked in the ascendancy at this point and pushed forward for the winner but left themselves exposed at the back and it was the visitors grabbed the vital goal with two minutes remaining to win the tie 2-1. 2nd photo down is a great shot.